Hand Made Modern Sterling Silver Dangle Earrings, "Fabulous"
The fabulous design of these earrings is by Pichaya in Thailand. 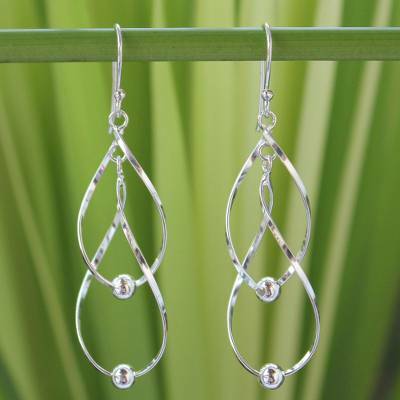 The earrings are expertly crafted by hand with the polished elegance of sterling silver. You can find sterling silver dangle earrings 'Fabulous' by Pichaya in jewelry categories such as Modern Earrings, No Stone Earrings, Silver Earrings, Sterling Silver Earrings and Dangle Earrings. Enjoy exploring these sections for other Novica treasures. Pichaya gives work to several women who assist with the crafting of her jewelry designs. Very nice pair of earrings. Just realized I chose another pair made by this artist. So I definitely like her work! "Now one of my favorites"
This beautiful earring goes with everything: dressy or jeans. The workmanship is perfect. "I want everyone to look nice every day, for I believe that when your clothes and your jewelry look good, you feel good too!" "I come from a family of farmers family so I grew up surrounded by rice paddy fields and green landscapes. My family is not rich; my parents had to work very hard to make a living and pay for my education. By the time I was seven years old I was helping out by selling fruits and vegetables. I also cooked and took good care of my parents as I would see them come home after work looking very tired. The best I could do at the time was just getting the food ready on the table. It was always my pleasure to see them enjoy eating my food! I am mindful of ways for making our lives better. "When you're seven years old, selling vegetables and fruits at the market isn't fun, but it has influenced that way I am today. "After graduating I set up my small workshop and started doing what I love most, jewelry. I have always loved wearing nice jewelry and I knew that one day I would create my own designs. My dream is to sell my jewelry all over the world and become well-known as a designer so that my parents won't have to work anymore and be proud of me. "But I know this isn't easy, interest and dedication alone isn't enough, so I began studying books and I read success stories about famous designers, then I applied for a job and worked for a jewelry exporter for over 2 years to get the experience that I could not learn from the books or classroom. "I had the opportunity to visit many workshops, see how they made different kinds of jewelry such as plain silver, stone jewelry, semi-precious jewelry, gold plated and gold stamp jewelry, ancient beads, old silver, leather, pearl and many more. "It amazes me how humans can create such wonderful things, how creative humans can be! Thai craftsmanship is great and silversmiths are too, I fell in love with jewelry. "My boyfriend also inspires me. He is a collector of antique decorative items and old silver jewelry. I travel a lot with him to explore and study antique jewelry from many places, see different styles and designs of jewelry featuring beads, gems, silver, leather, pearls, etc. I also learned different techniques from each place and each country. This is a great opportunity and it has widen my world and widen my experiences in jewelry. "I have learned a lot which I apply to craft my jewelry, and another benefit is I know where to source quality material. "I love to work closely with suppliers and silversmiths through every step of the process. I try to design and get the jewelry the way the market likes; we share ideas and experiences to help each other develop new and original designs. I also help some suppliers sell their jewelry as some of them are great in making but don't know how to sell or present their pieces. "My designs are simple and nice, just like me! My jewelry is designed for everyone and every age; it's comfortable and light weight. You can enjoy wearing my jewelry every day and for every occasion. I want my customers to enjoy buying and wearing my jewelry. I want everyone to look nice everyday, for I believe that when your clothes and your jewelry look good, you feel good too!" I love the detail and care that Pichaya took with the sterling Guanyin pendant! It works beautifully with formal and informal dress, and it's a perfect reminder to include compassion, mercy, and love in my thoughts and actions. The earrings that I purchased from Pichaya are lovely! The design is so unique and the silver quality very good! I loved everything about them so much I ordered a second style after receiving my first purchase. Thank you Pichaya for your quality work!